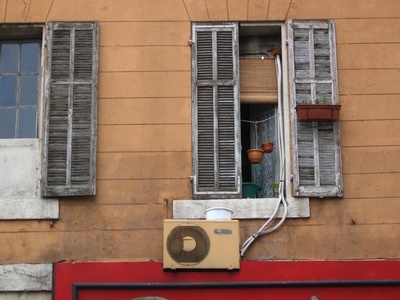 Air conditioning is an ingrained part of modern life. So many buildings have central or window-mounted systems that we are almost surprised when we walk into a building without one. However, this marvelous device that cools and dehumidifies the air is a mystery to most users. So how do these machines that we count on to cool our homes during hot summer days actually work? The basic principle of air conditioning is using compressed gasses and liquids to transfer heat from one location to another. When you're cooling your house, you're actually just transferring the indoor heat outdoors. In its purest form, an air conditioning system uses three components: compressor, evaporator and condenser. These are all connected using tubing such as copper that is designed to contain chemicals such as Freon under pressure and at extreme temperatures. When an air conditioner is running, the compressor pressurizes the refrigerant. Due to thermodynamics, the refrigerant heats up by being compressed. At the same time, the compressor pulls refrigerant from the condenser and causes low pressure to develop. The refrigerant then flows through a radiator called the condenser. By blowing outside air through the condenser, the heat is removed from the refrigerant and causes the chemical to condense into a liquid. The cool liquid then flows through tubing to the evaporator. Inside the evaporator, the path of the refrigerant narrows to restrict the flow. This is sometimes called a "metered orifice" and allows the compressor to create the pressure differential between the condenser and evaporator sides. As mentioned before, the compressor pulls refrigerant out of the evaporator side to pressurize the condenser. This low pressure causes the refrigerant to cool drastically. The cold liquid then flows into a second radiator called the evaporator. As the liquid flows, warm air (from inside the house) flows through and cools in the process. Because the heat is transferred to the refrigerant, it heats up and evaporates inside the tubing (hence the name). Eventually it makes its way back to the compressor to begin the cycle anew. By circulating the refrigerant in this manor, the warm air inside the house transfers its heat to the refrigerant. The refrigerant carries the heat outdoors where it is exchanged with the outdoor air. In addition to cooling the air, the system has the added benefit of removing moisture through the cooling process by condensing the water in the air onto the evaporator which then drains off. Much like a cold drink left out on a hot day. This is desirable on humid days for making the inside air more comfortable as well as cooler.